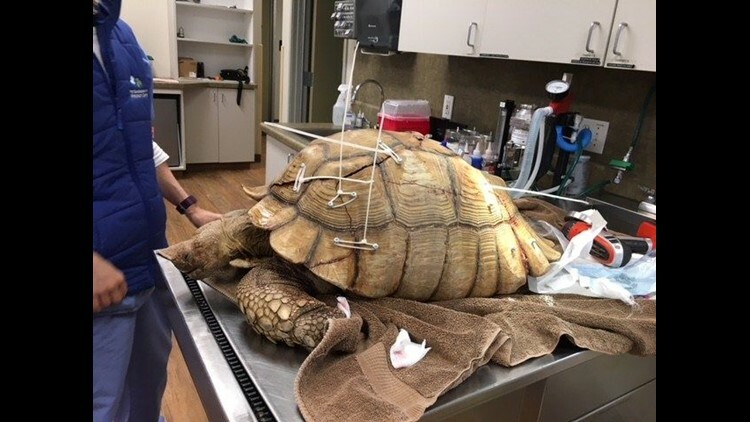 SAN DIEGO (NEWS 8/COUNTY NEWS CENTER) — A 70-pound African tortoise was injured during a fall in Fallbrook over the weekend and needed emergency care to repair his shell. 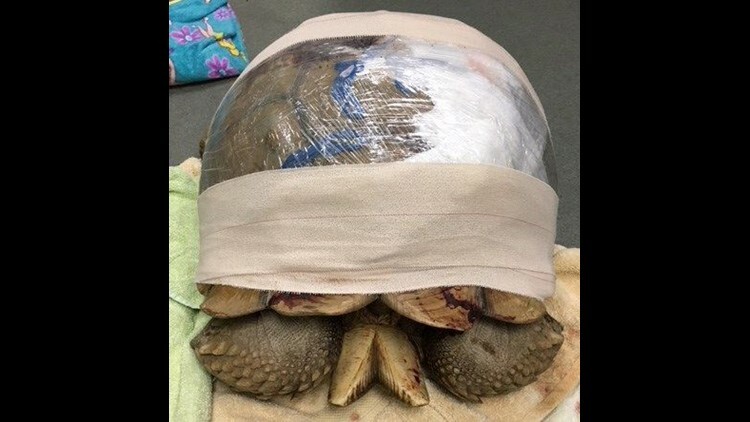 The animal was found with a severely broken shell was recovering from surgery on Tuesday thanks to the donor-driven Spirit Fund at County Animal Services. A good Samaritan found the injured animal in Fallbrook on Sunday. The Samaritan said a neighbor’s dog had chased the tortoise and it fell from a 10-foot wall. When the animal fell, he landed on his back and his shell broke in three places. The tortoise was taken to a veterinary hospital and that’s when County Animal Services was called in. An animal control officer took the shattered tortoise to a veterinarian that specializes in reptiles for emergency care and observation. The African spurred tortoise is a male between 35 to 40 years old. They typically live to be 70 years old. 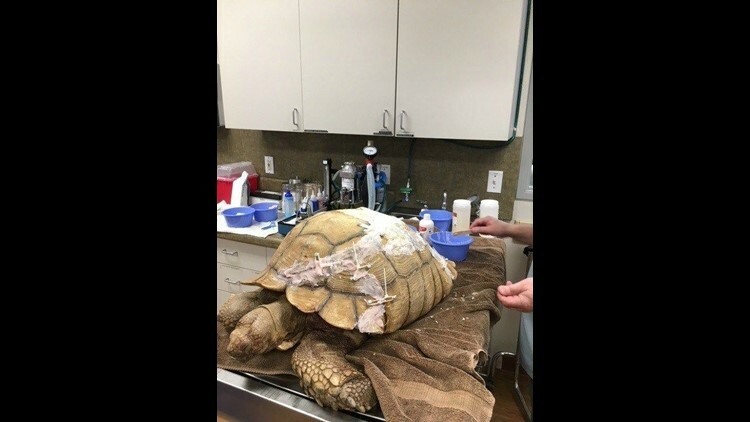 County Animal Services learned it would cost several thousands of dollars to put the tortoise back together again. The veterinarian put the broken shell together again using screws, wire, epoxy and plastic wrap. The photo above shows the animal from the front with his head tucked in. The tortoise then underwent extensive reconstruction surgery on Tuesday. DeSousa said the animal's prognosis was good following surgery. Those working on the tortoise placed screws into the shell and secured it using ties between the screws. A paste material seen in the picture below is the same material used to make dentures and will help to adhere and seal the cracks, according to DeSousa. Meantime, County Animal Services is looking for his owner. If the owner can’t be found, the tortoise will not become available for adoption. He’ll be transferred to a rescue group that has the training and qualifications to provide the necessary care. The Spirit Fund was created in July 2008 after a puppy was found severely beaten near the border. The dog was still loving despite her injuries and staff named her spirit. Her story brought donations for her care from across the country. So much money came in that the Spirit Fund was set up to care for other animals with severe medical needs. Over the years, the fund has continued to grow. Anyone interested in donating, can visit the Spirit Fund web page.